The City of Greenville started making great strides to revitalizing its downtown core over 30 years ago and today it’s blossomed into a lively community. Downtown Greenville real estate is in the Upstate’s largest central business district. As far as housings, there really is something for everyone. Downtown Greenville real estate is diverse, vibrant and just waiting to be discovered. Choose form modern luxury condos, classic Tudor-style character homes and mid-century single family houses. And with the city's booming restaurants, shops and entertainment, Greenville is the perfect place for every age. Whether you're a working professional or raising a family, you'll never run out of things to do in this lively metropolis. Read more about downtown Greenville houses for sale or feel free to browse through the MLS listings below. 383 Properties Found. Page 1 of 64. Don't forget to register with us to unlock advanced search settings and to save your favorite listings! While the downtown core itself is quite small, the neighborhoods associated with downtown Greenville stretch from Stone Avenue to Pendleton Street to Augusta Road to Rutherford. Popular neighborhoods include Augusta Road, Earle Street and North Main. Downtown Greenville SC homes for sale are made alive with their vibrant surroundings - food, music and entertainment. 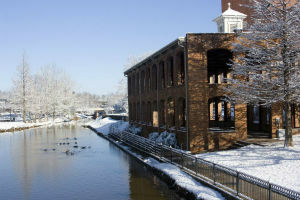 There are hundreds of restaurants, pubs and cafes to choose from when you’re out for a bite to eat in downtown Greenville. Revitalizing the downtown core has been an important undertaking for the City of Greenville. They have free parking available on weekends and weekly entertainment events taking place all year. With so much going on in this area it's no wonder that it’s one of the most sought after residential neighborhoods of Greenville. Imagine being able to indulge in weekly Jazz concerts hosted a few blocks from your new home, or walking to the iconic Liberty Bridge in Falls Park. Condos in Downtown Greenville SC definitely have some nice advantages as far as location. Enjoy being close to great amenities such as the Greenville Zoo, the BI-LO Center arena and the Fluor Field baseball diamond. There is also a lot to explore in the surrounding area of South Carolina. For example, there are over 500 historic sites in the area. Looking for a quick weekend getaway? The Blue Ridge Mountains are just a few hours away. Contact us to learn more about downtown Greenville SC homes for sale today. We can help you with any inquiry you might have.